What can we learn from the demographics of DC’s unique voting precincts? Tomorrow, District of Columbia residents will go to the polls to vote in this year’s primary election. Voters will decide which candidates will represent their party for Mayor, at-large Councilmember and, in some places, Ward Councilmember, among others, in November’s general election. As results begin to roll in on Tuesday evening, many will wonder how candidates fared in different neighborhoods. What do the places that preferred incumbent Mayor Gray look like? How are they different from the neighborhoods where Muriel Bowser, Jack Evans, Tommy Wells, and other challengers won the most votes? Until now, this was a difficult question to answer. Washington, DC’s voting precincts are unique areas used for tabulating and reporting election results. They don’t map cleanly to Census Tracts, Advisory Neighborhood Commissions, or other neighborhood-level geographies. The reference map provided by NeighborhoodInfo DC shows how these geographies, including voting precincts, fit together (or don’t). The DC Board of Elections will publish vote counts by precinct in the days following the primary. While the election winners are based on total votes cast across the city, looking at the results by precinct can help us understand better where different candidates received the most support. 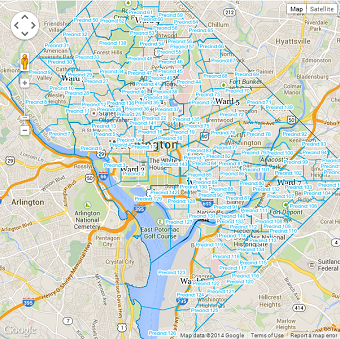 To help with this, NeighborhoodInfo DC has released data for voting precincts in time for the primary election. Anyone can download these data to look at the demographic makeup (including metrics like race, age, and income) for each of the District’s 143 voting precincts. These data allow analysts to understand the population of each voting precinct, though they don’t shed light on the demographics of actual voters themselves. Our hope is these voting precinct data will help those who want to analyze and understand tomorrow’s election outcomes, as well look ahead toward future votes.